Love the post, and LOVE the new layout and signature!!! love the colors and love the new layout!! Gorgeous! LOVE those knee highs - I am too scared to try them out in my wardrobe but you totally rock them. <3 Love the new layout too! 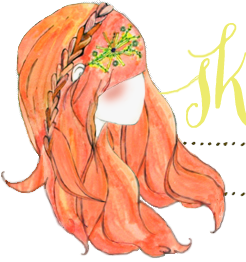 Love the new looks - hair and blog! I love all the bright colours in this outfit, and the turquoise of the dress is definitely perfect for spring. Oh, and I like how you tied the scarf - it looks like it's part of the dress. Definitely inspired and will be trying it soon; I love scarves but often get stuck in the same ways of wearing them so I'm always on the look-out for fresh new ideas! Love it I love (what you did with a scarf?) it's so beyond sweet. Pure loveliness. What an adorable outfit and the new blog layout is precious! Wonderful job Katie! Your hair looks great- I used to dye my hair that color before I had kids- I remember some damaged towels. I'm a faux ginger as well, and am always on the lookout for the right shade of red. If you don't mind me asking, which brand of hair dye do you use Katie? Do you dye your own hair? What do you use? You have the most fantastic color. I agree - newly dyed hair is the best! What's funny is that it looks perfectly natural on you! That dress is to die for, and I will always be in love with those shoes! This dress is too cute! Love the knee-highs with it. I've been a follower of your blog for a little while and I am so envious of your perfect loose waves. Does your hair naturally curve that way? My hair is so straight and I wish I had that little bit of curl like you do. Any tips or tricks? I would love a hair post that is just your regular routine (products, styling, etc). Also, your new layout is adorable! Guh! I love this dress, the scarf, the knee highs...this outfit is amaaaaazing. And yes, the hair looks grand as well. those knee high socks are killer and i LOVE the dress. your hair looks pretty, too! i remember seeing that cute bag on a beautiful mess. it's such a brilliant idea. Cute outfit. The shoes are cute, why not wear them everyday! You look adorable! And I'm loving the new layout. You wear it like a natural redhead! LOVE the layout! Hi Katie, I am a brand new follower. I wanted to introduce myself and say hi. I absolutely adore your hair color... So beautiful. Also, your little creatures are too cute. Do you ever make kangaroos? I collect little kangaroos... it's kinda silly but they are so cute. I am also a new blogger, so please feel free to pass along any advice, if you have some. Thanks so much! Wow that is gorgeous dress!! I like how you put the scarf with it too! Oh and by the way I love you new layout! You look adorable! Love your new blog design, it looks fabulous! Hey lady! Your purse diy has officially become my new project, love it and your outfit. CUTE! Hope all is swell and thanks for the new inspiration. I love,love what you're wearing. You look like you're 17! Love your hair color! And your outfit! This is so adorable and I absolutely love the colour combination! You look so very pretty. I really like the colours within this outfit and of course those shoes are so lovely. the new layout is gorgeous and i love your dress! You are looking lovely as always. I love having freshly dyed hair, especially after my roots start growing out. And I love your dress with that scarf! ooh i love this! and i just dyed my hair the same color this weekend. it's so fun to play around with redhead clothing colors that didn't look as good when i was just a brunette. cute dress! that offer designer cheap gucci handbags.